Methi (Fenugreek) leaves are such a delicious and healthy way to spruce up a curry and my favourite is to have it with paneer. Cooked in a gravy made from cashew nuts it is utterly divine. Perfect dish for a fancy dinner as it is really tasty! This recipe takes a bit of preparation work but is so very worth it! First prepare the cashew nut paste by pre-soaking the cashews in hot water for around 30 mins. Then put in a food processor and blitz till it is a smooth paste. Add a bit of water if you need to. Now make the onion paste by cooking the onion, garlic, ginger and green chillies in a tablespoon of oil on medium heat for around 20 minutes. Add the water in. Now take the onion mixture and put aside till it cools down a little in a bowl. Once cool, blitz this onion mixture in a food processor so it becomee smoother. Now heat oil in a kadai on medium heat and add the cinnamon stick, bay leaves and cloves. After around 3-4 minutes add the onion mixture and cook for around 10 minutes. Add the turmeric, red chilli, cumin powder and coriander powder and mix and cook for 2 minutes. 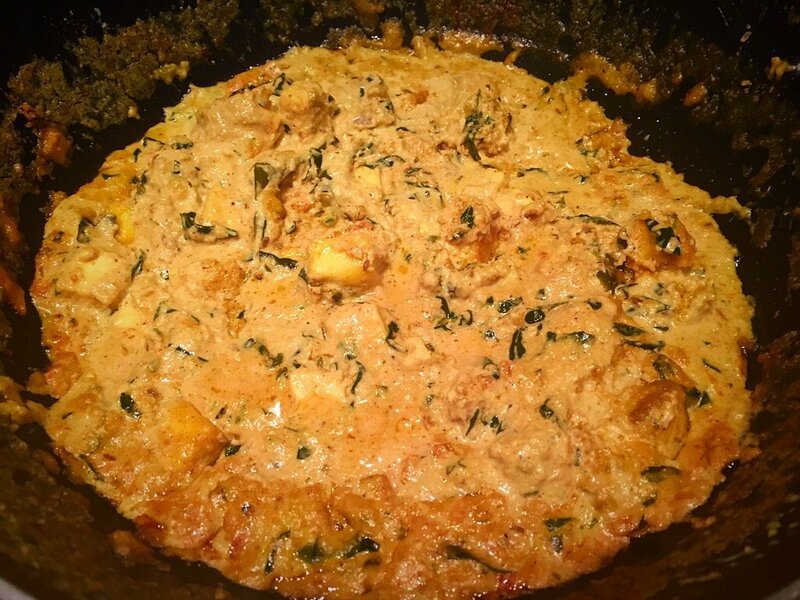 Now add the methi leaves and 60ml water and let this cook for around 3 minutes and then add the cashew paste. Add some more water if you need to so it has the consistency of gravy. Cook this for a further 3 minutes and add the paneer cubes in. Add the garam masala and salt and cook for a few minutes. Now add in the cream and kasoori methi leaves. Put the lid on the pan and let this cook on low heat for around 5 minutes and this is then ready.